San Francisco’s freezing summer is finally finished which means it’s almost time for the Table Hop and Taste, one of my fave charitable events of the year. For the last decade DINING BY DESIGN, presented by DIFFA: Design Industries Foundation Fighting AIDS, has produced this top-notch charitable event for uninsured HIV/AIDS patients, showcasing top designers who create unique tabletop installations that are on show for two nights only. DINING BY DESIGN offers two completely different over–the-table-top dining experiences, although both feature scrumptious food paired with excellent wines and cocktails surrounded by innovated table designs: the fun-filled TABLE HOP & TASTE cocktail table preview party on Wednesday, November 17 and the seated glam GALA DINNER on Thursday, November 18. Since it’s for such a good cause, you might want to consider going to both. What: Guests have a chance to view all tables and meet the designers while enjoying fine wines and Ketel One vodka cocktails matched with delectable hors d’oeuvres prepared by several of the city’s top restaurants. 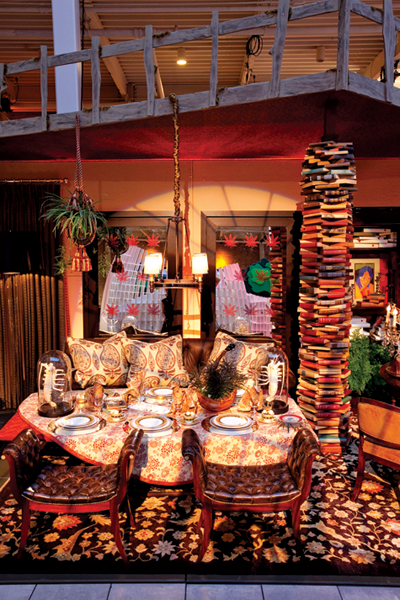 Come view all the table installations and meet the designers as they explain their inspirations. Then hop over to the silent auction for some fantastic items. What: The showpiece event begins with a table viewing reception featuring fine wines and Ketel One vodka cocktails followed by a three-course seated dinner. Dinner guests are seated at one of the signature design tables and may also participate in the exclusive Silent Auction, including luxury gift packages, fine décor items, rare vintage wines, and one-of-a-kind works of art. When: Thursday, Nov. 18 Reception: 6:30 p.m. – 8 p.m., Dinner: 8 p.m. – 11 p.m.